For as long as I can remember, my family has had Swedish meatballs for our Christmas Eve dinner. This tradition went on hiatus for a few years, however, once those of us who weren’t actually cooking the dinner protested that the prepackaged powdered grocery store mix just wasn’t cutting it. Was the packet mix easy? Yes. Delicious? No. Edible? Barely. So after a few years of not having Swedish meatballs for Christmas Eve, because my mom was cooking the meal and didn’t want “all that hassle,” I took it upon myself to find a decent from-scratch recipe to make them myself. We are all glad for that, because now we are back on track with our family tradition, and these meatballs taste better than any we ever had before. This recipe modified from here. In a large pan, melt 1 T butter over medium heat and sauté the minced onion until soft and golden, about 5 minutes. Remove pan from heat to cool slightly. In a large bowl, combine the meat, bread crumbs, milk, egg, salt, pepper, allspice, nutmeg, and the cooked onion. Mix together very well. Refrigerate the mixture for at least an hour before forming the meatballs. Form the mixture into 1-inch meatballs and set aside. Melt 1 T butter, in the same pan, over medium-high heat and add meatballs (as many as comfortably fit in the pan). Sauté meatballs, tossing and stirring. until evenly browned on all sides, about 10 minutes. Move browned meatballs to a separate bowl and add the remaining meatballs. When all meatballs are evenly browned and removed from the pan, sprinkle flour over remaining fat and cook, stirring, for a few minutes. Stir in the broth, water, cream, dill, and pepper. Turn up the heat just until the sauce bubbles, then turn down heat to low. Add the meatballs and any collected juices to the pan. Cover and cook for 30 minutes or so. Check consistency of the sauce after 15 minutes: if it seems thick, add a little more water and cover to continue cooking. If it seems thin/watery, cook uncovered for the remaining time. Start by getting all the ingredients in place. Most supermarkets sell ground pork, although it might be in the fresh meat case and not in with the prepackaged ground beef. Be sure to use both meats, though, as each one adds its own unique texture and flavor to the mix. As always, I prefer grass-fed beef, and an 85% lean/15% fat is a good ratio to give good flavor without being greasy. Get the other ingredients ready to go, too. To make fresh bread crumbs, just cut up some day-old dry bread, or frozen bread, into medium chunks and pulse them in a food processor until evenly ground. Alternatively, use prepared bread crumbs, but be sure to use unseasoned, plain bread crumbs. In a very large pan (one big enough to use later for the meatballs), melt 1 T butter over medium heat and add the minced onion. Sauté until soft and golden, about 5 minutes. Remove pan from heat to cool slightly. Place the ground beef and ground pork in a large bowl. Mix them together, using your (clean) hands and fingers. Yep, your hands will get dirty making these, but the results will be worth it! When combined, add the bread crumbs, milk, egg, salt, pepper, allspice, nutmeg, and the cooked onion. Scrape all the onion and as much of the melted butter from the pan as you can. Set the pan aside. Mix together very well with a wooden spoon. When it’s pretty well mixed, give it one last go with your hands to really incorporate everything evenly. Then refrigerate the mixture for at least an hour before forming the meatballs. I’m guessing you’ll end up with 4-5 dozen meatballs. Here’s how many I got. You can count them if you’d like. Melt 1 T butter, in the same pan you used for the onion, over medium-high heat and add as many meatballs as comfortably fit in the pan. Don’t overcrowd the pan: leave enough room so you can stir the meatballs, toss them around a bit, and shake the pan to roll them around. Sauté meatballs until evenly browned on all sides, about 10 minutes. Move the browned meatballs to a separate bowl, leaving the drippings and juices in the pan. Brown the remaining meatballs. While the meatballs are browning, get the sauce ingredients ready. Once all meatballs are evenly browned and removed from the pan, sprinkle the flour over the remaining fat. Cook, stirring, for a few minutes, then stir in the beef broth, water, cream, dill and pepper. I love this plastic whisk for this step. Turn up the heat just until the sauce bubbles, then turn down heat to low. Add the meatballs and any collected juices. Cover and cook for 30 minutes or so. If your super large pan doesn’t have a cover, like mine doesn’t (Santa, are you paying attention?! ), just use tin foil. Check consistency of the sauce after 15 minutes: if it seems too thick, add a little more water and cover to continue cooking. If it seems thin/watery, cook uncovered for the remaining time. If it’s too thin, you could stir a couple tablespoons of flour into about ½ C of cold water, and slowly stir that into the sauce. I like a consistency of a gravy, myself. Do whatever feels right for you. Serve over mashed potatoes and — if you have been to IKEA lately or any other upscale grocery store — with a side of lingonberries as well. And something green…just for color. Enjoy! Freeze any leftover meatballs and sauce to reheat for an easy weeknight dinner. I’m happy you posted this recipe because I actually used to like the Swedish (the IKEA one) meatballs, but the last few times I had them there was really unsatisfying (cold, or plastic tasting, etc) so I really have to give a try to making them myself. Thank you for sharing! 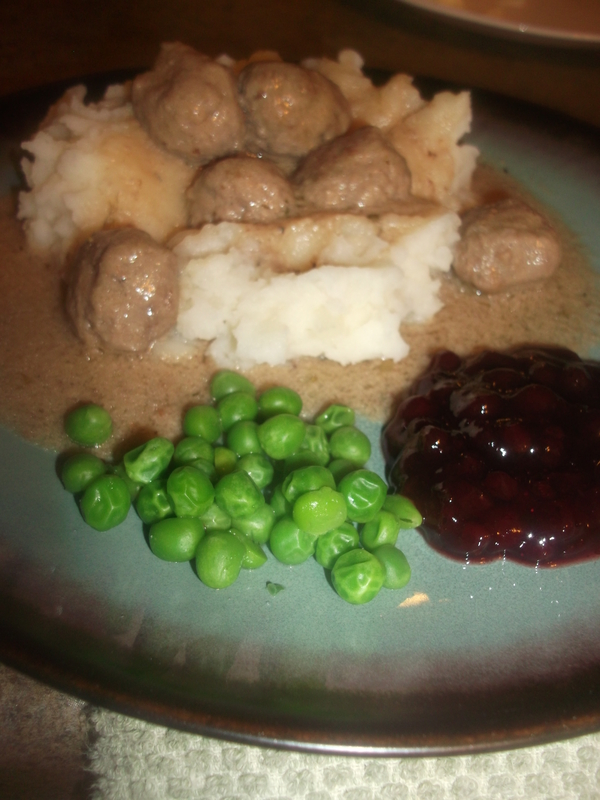 We also enjoyed Swedish meatballs, got them at Nelson’s Meat Market on Shady Oak road. Now we will have yours on Christmas Eve. Thank you for the recipe. Glad to hear it – hope they are even better than you remember them! Great recipe. Tried it and the family is now saying I have to bring them every Christmas. Then I found out you are a fellow Minnesotan! No wonder these meatballs are so good! Ya, Uff Dah! Ya, you betcha! Dontcha know, any Minnesota recipe for something Scandahoovian is sure to be a hit! I hope you don’t mind your new role as the Christmas meatball guy :-).